I am so excited to be able to spread my message of healthy living and the yoga lifestyle on WINK News. If you are not up at 7:15 am on Friday mornings or you live out of town, you can catch the Healthy Living Tips on this page. Please feel free to share and interact with me. My passion is your health and mine, so whatever way I can pass on information to you, I am all about. 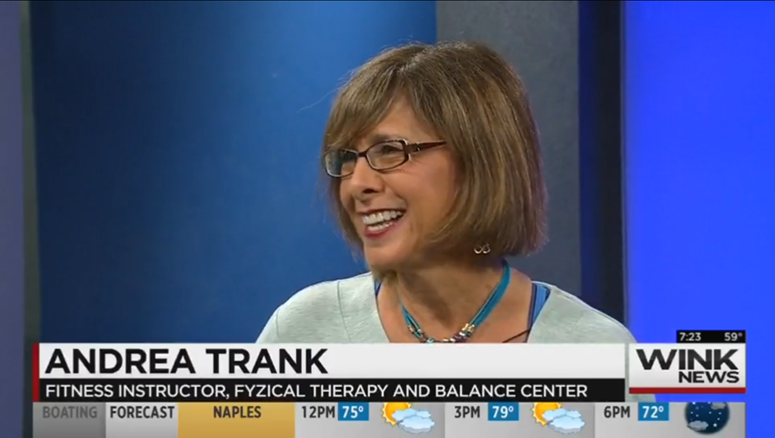 As seen on WINK NEWS – Andrea Trank speading her healthy living message! Yoga Instruction – I have been practicing yoga since 1995. During my school teaching days, it kept me sane and healthy. I trained as a yoga instructor in 2014. I am an RYT Hatha trained Yoga Teacher with specialized training in the following: Yoga Anatomy, Yoga for a healthy back, Yin Yoga, Adaptive Yoga. I recently read that practicing yoga and meditation regularly reduced doctor’s visits by 43% in one study. Seems like a good choice to me! Come get your dose of nature and wellness with Heaven Lane’s unique brand of yoga.